“I will let you sing my song if you can relate, let you get the lyrics wrong, they’re not that great”. This week we foray into the short listed nominees for the Polaris Music Prize, a music award that’s held annually to honor the best full-length Canadian album based on artistic merit, regardless of genre, sales, or record label. One band that’s been rippling the airwaves, is the pop quartet from PEI, (that stands for the Canadian province, Prince Edward Island) who calls themselves Two Hours Traffic. Their 2007 sophomore effort, Little Jabs, is one album that is highly worth your time, offering ten virulent chunks of vibrant pop music garnished with incredibly catchy hooks and a set of melody that’s meant to get you instantly synchronizing to the music. 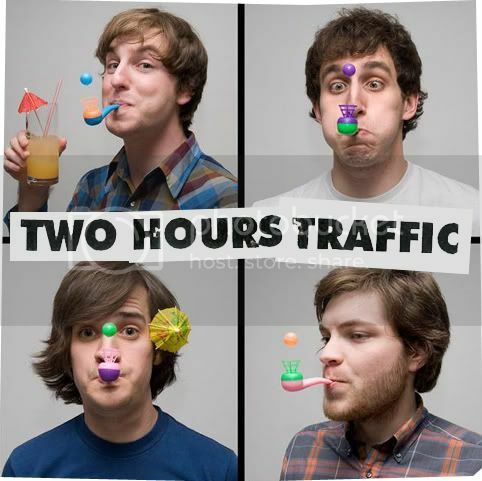 With their conventional, straightforward pop creations, Two Hours Traffic recalls to mind just how great it is to fall back into familiar territory once in a while. Little Jabs takes off at an energetic stride with ‘Nighthawks’, taking you through a glittery guitar maze and an ebullient sounscape built up from rapturous sing-alongs. Passionate with and unrelenting sense of young vigor, the song just overflows with brazen fun, a perfect start to a perfect record. Further into the album, the band impeccably shifts from perfect power-pop tunes to pleasing portions of folk-rock. By the time you get to the third track, and you’re still not tapping your feet or moving your hips to the buoyant, surging rhythm of the jangly guitar lines, then dude, I think you need to get your pulse checked. ‘Stuck for the Summer’ swells up into rapid, scrumptious hooks close to the climax, accentuating the crisp, clear melodies as it concocts the ideal theme song to soundtrack your summer. Conventional and straightforward? Nope, not these guys.